The results of his pursuits with a camera from such a young age have developed into a unique photographic style. It is one that emulates motion and speed into scenes showing glimpses of action, movement and behaviour not often noticed for its beauty by the human eye. When most people are trying to freeze motion, Andre is slowing it down and capturing as an art form. This style was recognised by winning the ultimate prize in wildlife photography: Winning the Mammal Behaviour category in the BBC wildlife photographer of the year competition 2003. 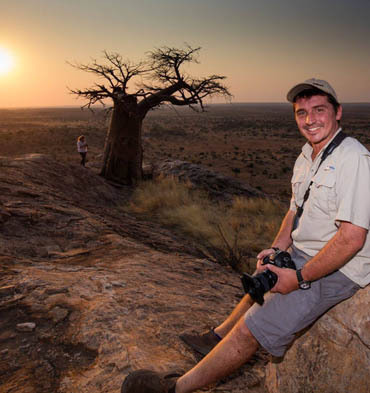 André's hard work paid off due to his dedication, his love of African nature and the joy that he gets from looking through the view finder at the subjects that he loves. André's speciality is using his excellent natural history and bird knowledge to predict movements of an animal and position in place so you can get your images in time. He is constantly thinking away form the norm and imparts these thoughts while on drives. This allows you to read into particular photographic mind that is always challenging what the normal eye does not see. BBC wildlife photographer of the year 2003 annual awards book. Awards 2003 Winner animal behaviour, Mammals. BBC wildlife awards.